Broadway Bound! Stampin' Up! Artisan Blog Hop! Digne de Broadway! Hello! 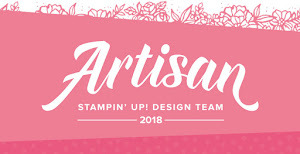 This month the Stampin' Up! 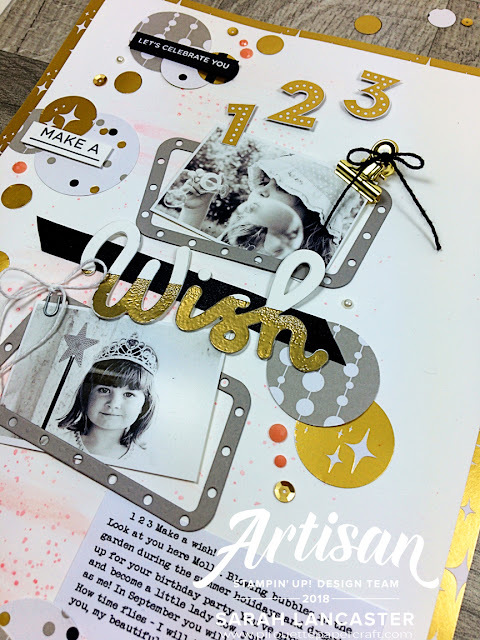 Artisan Design Team are featuring the Broadway Bound suite of products and I'm delighted to share with you today my creation for our blog hop. 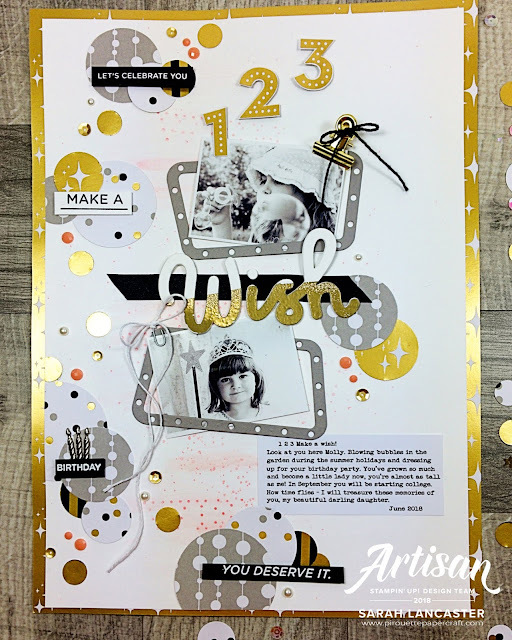 This month I have chosen to create a scrapbook page because ... well to be honest it's been a while and I wanted to share with you how this suite can be used not just to celebrate birthdays! I definitely fell in love with the gold in this collection and so I decided to dedicate my creation to my daughter, Molly and my two favourite photographs of her. I wanted to stick to neutral colours so I chose to print my photos for my scrapbook page in black and white. I fussy cut the numbers out of the DSP. For the "wish" I die cut three times in whisper white card stock and then stacked the die cuts on top of each other. Then using my Versamark ink pad I covered half of the die cut with the ink and sprinkled on my gold embossing powder and heat set it. I used various sized circle punches to punch out from the DSP. I used white embossing powder on basic black card stock to make my stamping stand out too. So you can see that this set isn't just for birthdays! 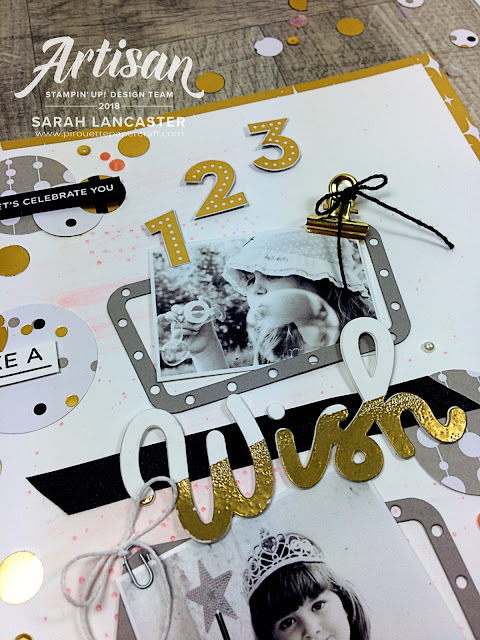 I hope that you love my creation and that my scrapbook page gave you some inspiration. On the other side of the world you will hop to Susan in New Zealand and see her awesome projects. But come back soon! Sarah...A-MAZ-ING! I love this scrapbook page! Everything about it is perfect! Hugs! SO fun! I love that you went with a monochrome colour scheme and added black and white pics. This is such a gorgeous layout!! Wow Sarah! So many beautiful details. I really like how you used the light frame to frame and offset your photos. So clever. Lovely work. Sooo cute and so lovely! I love all this details and the beautiful photos! That's a perfect combination! What a lovely page, Sarah! Love all of the beautiful details! This is just awesome and stunning! What a fabulous idea! Your layout is amazing!!! This is so gorgeous! I absolutely love all the details! 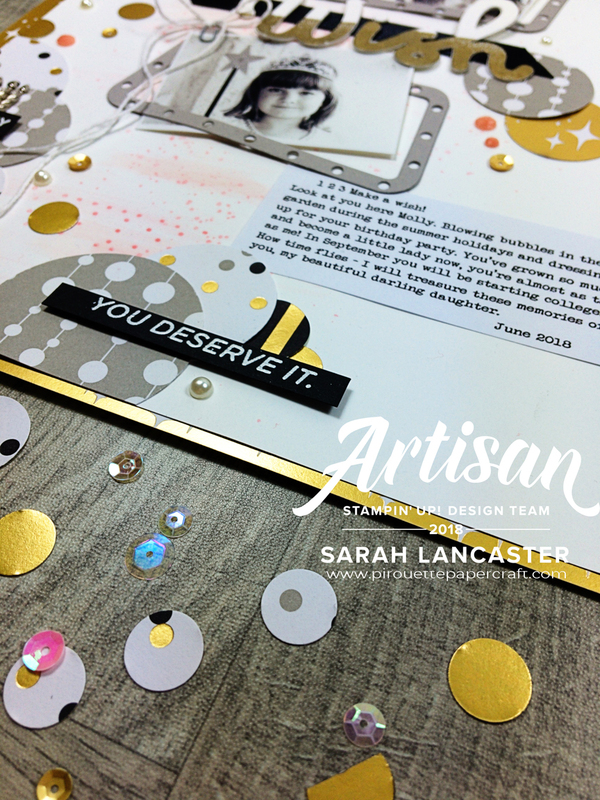 Love that gold with the grey and the layout is just gorgeous! Sarah this scrapbook page is such a delight. It's filled with sweet and perfect details that make me smile. This page is awesome! Love how you've pulled all those blacks and golds together so well and all the little details too. Totally aced it!